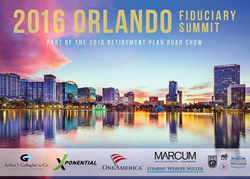 Xponential Growth Solutions and Arthur J. Gallagher announce the Orlando Fiduciary Summit, on June 14th, 2016 at The Grand Bohemian Hotel. The summit is part of the Retirement Plan Road Show: a national series of educational workshops designed for 401(k), 403(b), and retirement plan sponsors, trustees, and fiduciaries. ...will help local fiduciaries and their participants and beneficiaries take the best possible actions to insure the most secure retirement possible. The 2016 Orlando Fiduciary Summit is an educational workshop that brings together both local and national expertise to interact with Finance, Human Resource, and Benefit executives, along with fiduciaries and Business Owners. The goal being to help employers reduce fiduciary risk, identify plan upgrades, and make better decisions that positively impact participants. they help the nation’sretirement plan sponsors, fiduciaries, and trustees evaluate their plan and navigate the retirement plan industry.Working to help America reach their retirement goals one retirement plan at a time, XGS also founded the Retirement Plan Roadshow - a national series of fiduciary educational summits dedicated to human resources, finance and business professionals in charge of America's 401(k), 403(b), and retirement plans.